The San Jamar SCDG13LP Escali low profile digital scale accommodates as much as 13 pounds and displays the weight of product in 0.05-ounce increments. Items can be weighed on plates or inside containers with the tare feature, which resets the weight to zero to subtract the weight of the container. The unit is simple to operate with its user-friendly, two-button interface. Both the buttons and display are sealed for water resistance and easy cleaning, and its 5.75-inch-by-5.75-inch stainless steel platform is removable to further simplify the cleanup process. 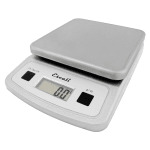 The San Jamar SCDG13LP Escali low profile digital scale saves energy by shutting down automatically. Do you want to learn more about portion control scales? Take a look at our portion control scales buyers' guide.